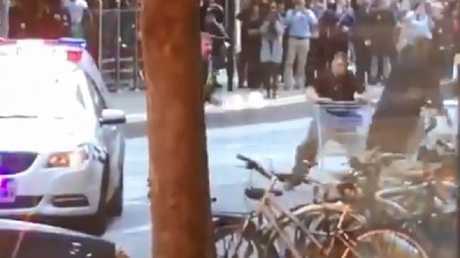 A MAN with a shopping trolley has been praised for rushing towards danger in a bid to subdue a knife-wielding attacker who had just stabbed three people in Melbourne. 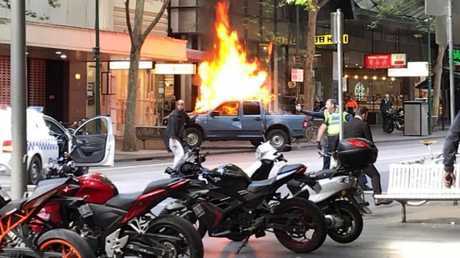 Police are at the scene of a major operation in Bourke St in the CBD after a vehicle crashed and exploded in flames about 4.20pm. The driver then got out and began stabbing pedestrians in a terrifying frenzy, injuring two and killing one, police say. Video shows the dramatic moment the attacker lunges at two responding police officers with the knife. Simultaneously, one heroic eyewitness rushes at the attacker with a shopping trolley, briefly slowing him down but falling in the process. Meanwhile, another bystander closes in while holding a chair grabbed from a nearby eatery. 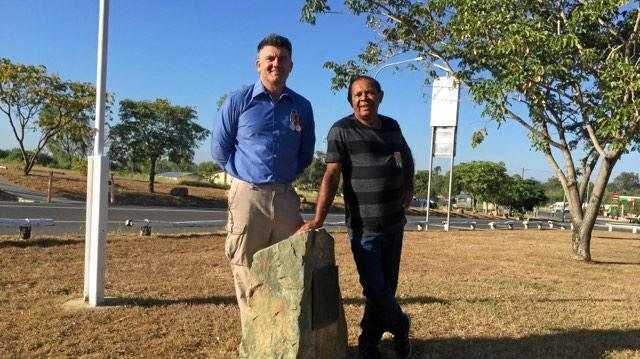 The first man was not deterred and sprung back into action, charging towards the attacker for a second time, shoving the trolley in his direction as police opened fire. Police confront the man armed with a knife after his car exploded. 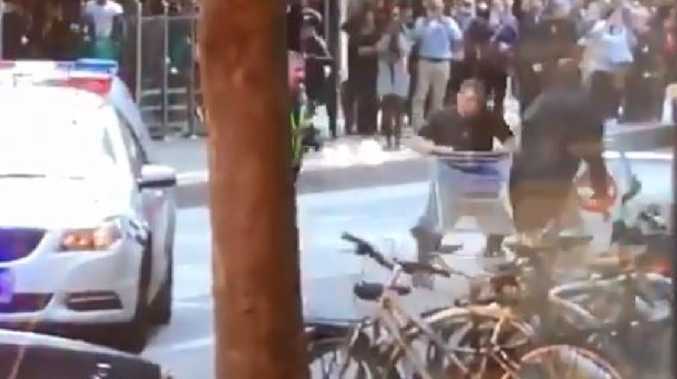 "Total respect to the shopping trolley hero trying to take down a mad knife man with nothing but a metal basket on not very good wheels," Paul Cochrane tweeted. 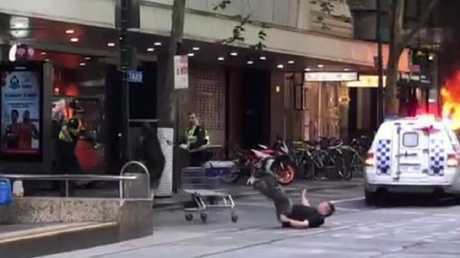 "Incredible work by police in Melbourne but also bystanders - one using a trolley to try subdue the man," Cyndi Lavrencic said. "Cops trying to take down man armed with knife. Passer-by seems to be trying to take him out with a shopping trolley!" Dan Nolan said. The attacker is in hospital in a critical condition and investigators have not released any information about his identity. The bomb squad is on the scene. People are being urged to stay away from the area. Investigations are continuing. The trolley pushing hero falls to the ground before getting up and charging again.